NETWORK FINALS: Lots of 0.1 adjustments today, as the ESPYS, AMERICA’S GOT TALENT and BIG BROTHER went up, but THE NIGHT SHIFT, WAYWARD PINES and the CRIMINAL MINDS rerun traveled down. CABLE HIGHLIGHTS: USA’s hope for a Season 2 MR ROBOT surge didn’t come to pass, as the 90-minute 0.43 premiere for the new Emmy nominee was down 0.03 from both last year’s series premiere and finale. It was followed by the post-show HACKING ROBOT at 0.17. SUITS, at 0.53, was down 0.08 from the 2015 premiere and down 0.09 from the summer finale. On a smaller scale, IFC’s MARON ended its run with a 1-hour episode at 0.05, up a tick from last week. Sundance’s THE A WORD premiered at 0.02/100K. The premieres of Lifetime’s LITTLE WOMEN LA and LITTLE WOMEN ATLANTA were respectively at 0.47 and 0.45. The night was led by A&E’s DUCK DYNASTY, with 2 episodes at 0.58/0.55, up from last week’s pair of 0.50s, followed by WAHLBURGERS, up a tick to 0.40. OWN’s GREENLEAF fell 0.11 to 0.52. On Bravo, REAL HOUSEWIVES OF NYC was down 0.07 to 0.49, and FLIPPING OUT returned at 0.31. 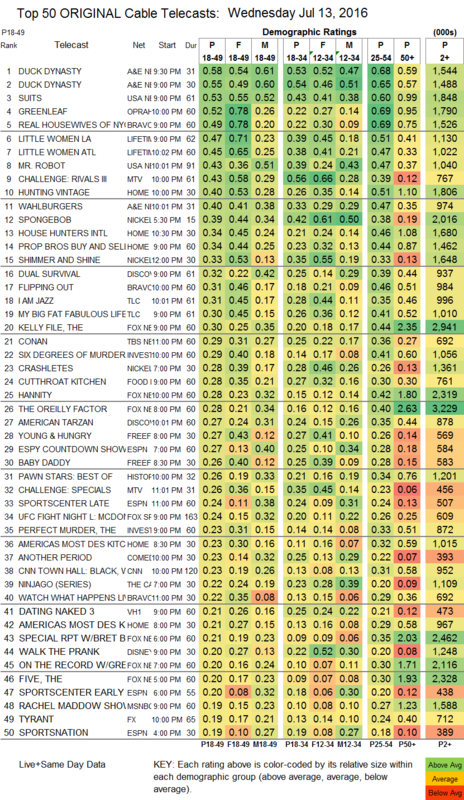 MTV’s THE CHALLENGE fell 0.08 to 0.43, with the post-show at 0.26. On HGTV, HUNTING VINTAGE was at 0.40, HOUSE HUNTERS INTL dropped a tick to 0.34, PROPERTY BROTHERS BUY & SELL was at 0.34, and AMERICA’S MOST DESPERATE KITCHENS was at 0.23/0.21. On Discovery, DUAL SURVIVAL was down 0.03 to 0.32, and AMERICAN TARZAN was also down 0.03 to 0.27. At TLC, I AM JAZZ slipped 0.02 to 0.31, and MY BIG FAT FABULOUS LIFE was steady at 0.30. Food Network’s CUTTHROAT KITCHEN lost 0.02 to 0.28. On Freeform, YOUNG & HUNGRY was down 0.02 to 0.27, and BABY DADDY held at 0.26. Comedy Central’s ANOTHER PERIOD rose 0.02 to 0.23. 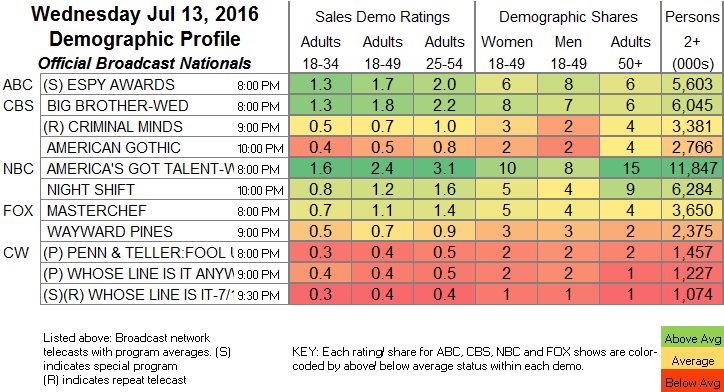 VH1’s DATING NAKED fell 0.12 to 0.21,and BARELY FAMOUS ticked down to 0.09. FX’s TYRANT was down 0.08 to 0.19. HBO’s ANY GIVEN WEDNESDAY, airing against The ESPYs this week, dropped 0.05 to 0.09. On El Rey, the first hour of LUCHA UNDERGROUND was steady at 0.04/108K, and the 2d hour ticked up to 0.02/56K.